Jeff is a writer and a meditation instructor. His primary subject is the mind, whatever that is. 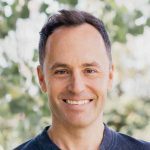 He is the co-author, along with Dan Harris and Carlye Adler, of Meditation for Fidgety Skeptics, as well as the author of The Head Trip, a travel guide to sleeping, dreaming and waking consciousness. He has won awards for his writing about whales and psychedelics, which are never to be mixed, for obvious reasons. Jeff got serious about meditation in 2004, and has been studying with Buddhist teacher Shinzen Young since 2008. Jeff’s specialties as a guide – i.e., those things he has the most personal experience with – are obsessive writerly over-thinking, childish anger outbursts, dysregulated mood swings, high sensitivity emphatic-overwhelm, existential despair, and, lest he forget (forgetfulness! that’s another), ADD-style attention-hijacking. For all these reasons, his favourite meditative principle / intervention is equanimity. He can talk forever about equanimity, and frequently does, thus strategically introducing the challenge of sleepiness to all those who accidentally listen to him.